This sterling silver sand cast mens ring shank is inlaid at the top with turquoise, coral and jet. It measures approximately 1/4" wide in the center and tapers down the shank. Inlay across measures about 3/4" long. 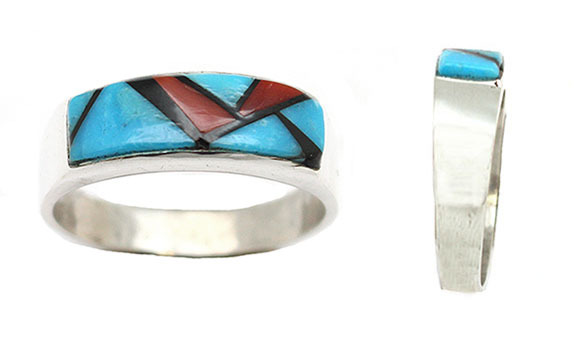 Crafted and inlaid by Navajo artisan Rita Ybarra. Currently only this one available and is a size 11. Picture shows side view of ring also.